T204606: Some requests time out after 60 seconds in MobileFrontend transforms. What to do? The web request times out are enforced since September 10th (see T97192#4561879 and https://lists.wikimedia.org/pipermail/wikitech-l/2018-September/090803.html ). We have not deployed a train since then. Maybe we always had the issue and it is now showing up due to the timeout limit being now respected. hashar moved this task from To Triage to Active Situation on the Wikimedia-Incident board. 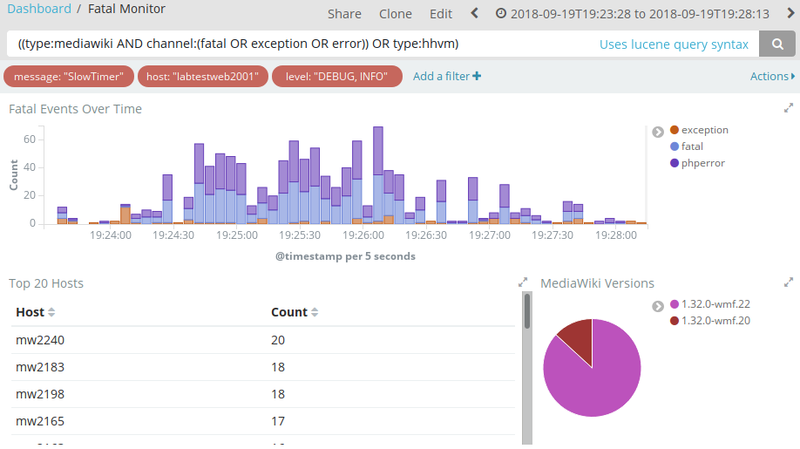 hashar renamed this task from Promoting group1 to 1.32.0-wmf.22 caused a spam of web request took longer than 60 seconds and timed out to Deployments of MediaWiki with scap cause a spam of "web request took longer than 60 seconds and timed out". Logs are full of this error message. greg moved this task from Active Situation to Follow-up/Actionables on the Wikimedia-Incident board. Making this a follow-up/actionable to track this work better/more realistically. Krinkle merged a task: T203664: scap timeout checking index.php/api.php mwdebug1001 / mwdebug1002. Krinkle added subscribers: Krinkle, Tgr, Jdforrester-WMF and 2 others. The issue about app servers having the first few requests time out after a deploy, naturally, also affects the canaries. As such, this is sometimes causing the endpoint checks, whhich Scap performs against canaries during a deployment, to sometimes fail. The above report is about mwdebug (which is slower in general due to being a VM), but I've seen it happen on other canaries as well. I've seen that as well, and just as problematic is that it's rather hard to determine the difference between incidental slowness due to the deployment itself vs breakage actually caused by the new code being deployed. Krinkle added subscribers: Joe, akosiaris, PeterBowman and 3 others.